Posted on Thursday, January 26th, 2012 at 8:55 pm. I have often been accused of chasing shiny objects, but no one can fault my hashcapade obsession. One simple tweet is all it took for me to juggle my schedule and high-tail it to Toast: Can you blame me? Toast tweet calling my name! See what I’m saying? 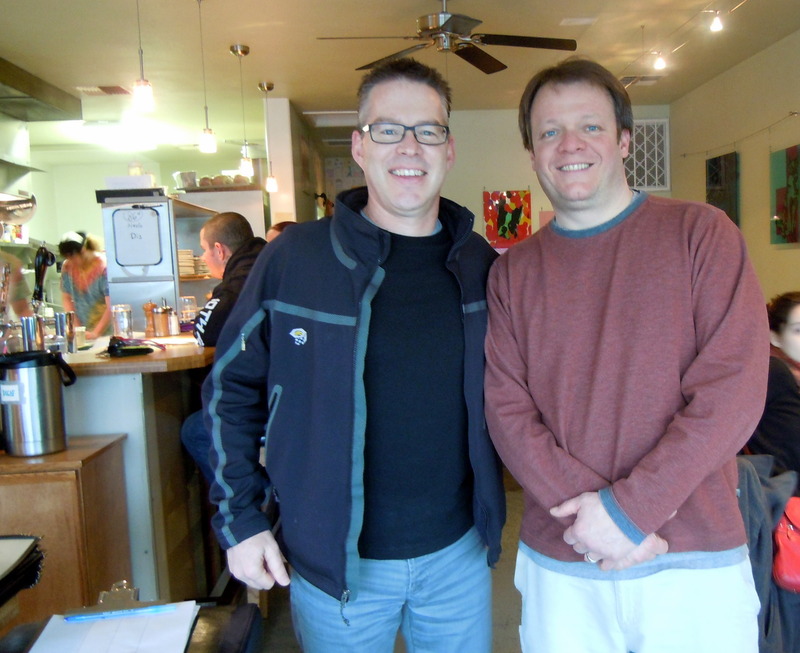 Observant readers may recall my Manifest Destiny Hashcapade at Yolk, the food cart offspring of Toast owner, Don Kotler. 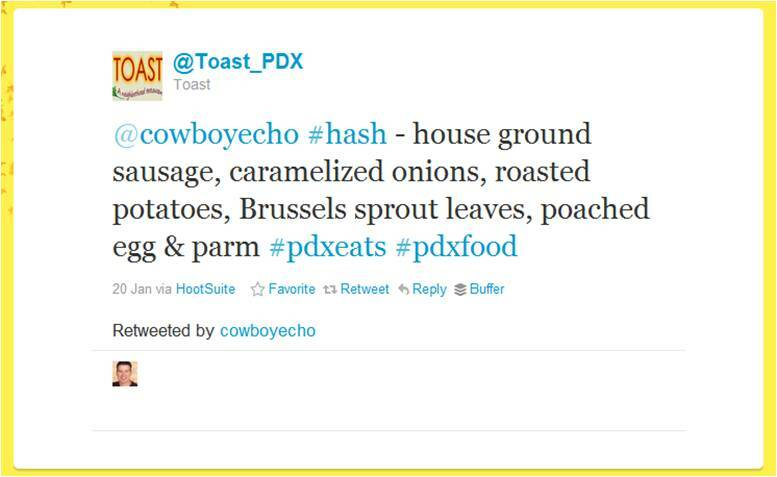 Can I just say that Don’s potato hash creations are the most innovative and varied in Portland? I explained this to my lunch buddy, Lindsey McBride, the mastermind behind Toast’s PR and the tweet that kicked off this post! 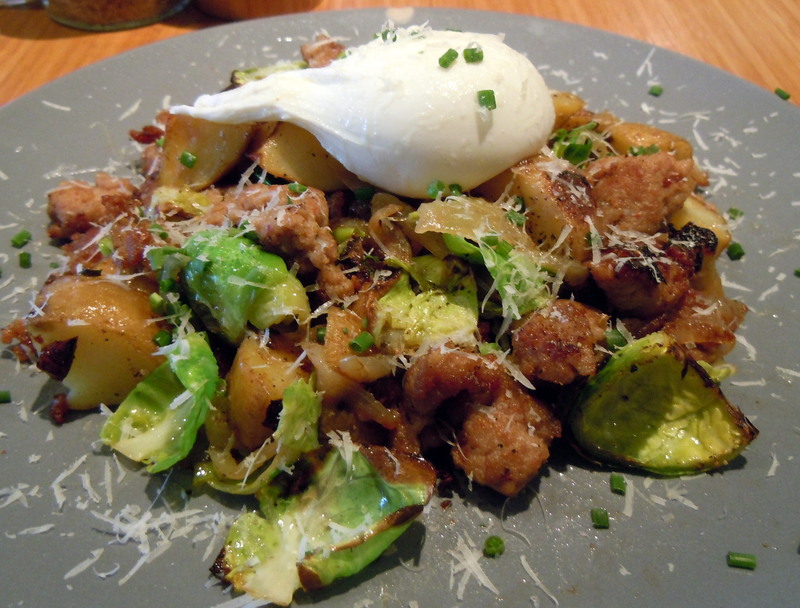 When the sausage hash arrived, I was instantly smitten by the Brussels sprout leaves that adorned the plate, splashing it with bright green colors. The house-ground sausage was perfectly cooked with a slight crispness that was superb. And the pièce de résistance, caramelized onion and parmesan cheese that anchored yet another sublime creation – omnomnom! Your author with the sausage hash genius, Don Kotler. So, a shout out to Don, genius hashman and great guy, his staff at Toast, and Lindsey for accommodating me by rustling up their special so late in the day. I can’t wait for my next Toast hashcapade!